Fulfilling expectations as an exciting and climatic round for the NASCAR Camping World Truck Series, the final laps of the Mountain Dew 250 furnished a three-way drag race coming to Talladega Superspeedway's start/finish line. The second of two superspeedway races on the NASCAR touring series' 2010 calender, the truck race came down to the final 5 laps of a scheduled 94-lap distance. Driving his #18 Toyota Tundra, Sprint Cup series regular Kyle Busch propelled himself into the first place position on lap 89 passing the #84 Toyota of Chris Fontaine. Qualifying strong in 6th place, Fontaine enjoyed a storybook career run leading 15 laps at the front of the Mountain Dew 250 but fell would be plagued in the latter stage of the race with an ignition problem. Finishing in 19th place, Chris Fontaine's otherwise front-running performance ended well off the mark. 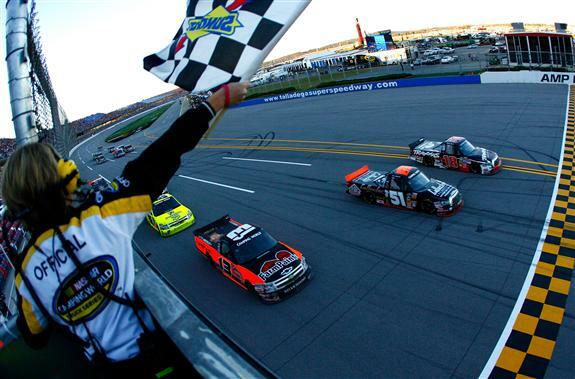 Having been a relatively tame event with only a handful of race win-contending trucks out of the event, a sizable field remained on track at Talladega Superspeedway through the final sprint to the checkered flag. Busch, Todd Bodine, Aric Almirola, Ron Hornaday Jr's and many other top drivers were in striking position for the Mountain Dew 250 victory. Pole sitter Hornaday in the #33 Chevrolet led 47 laps in his most aggressive run at Talladega but the Toyotas of Kyle Busch and Aric Almirola would control the lead. Mirroring the battle of the 2009 event at Talladega, Aric Almirola flew to the lead for lap 90 as trucks began to jockey ever more contentiously for positions as the laps ticked away. Coming down to 2 laps remaining, the #95 Ford F-150 of Grant Enfinger impacted the rear of Todd Bodine's #30 Toyota. Also collecting the #5 Toyota of Mike Skinner, the #2 Chevy of Ken Schrader as well as the #60 Chevy driven by Narain Karthikeyan, the #33 Chevrolet of Ron Hornaday was most dramatically swept up in the late race big wreck. Turned sideways, the #33 truck was sent airbourne and upside down. 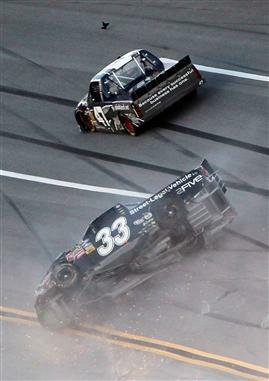 Sliding from the Talladega start/finish lane, Hornaday's truck settled after a long travel to the apron of turn 1. Talladega track safety crew (as well as fellow competitor caught up in the crash Todd Bodine) ran over to Hornaday's truck to fortunately find the #33 Chevrolet truck driver unhurt despite the rough ride. Ron Hornaday ended the race in 21st spot ahead of Grant Enfinger. Mike Skinner, Ken Schrader and Todd Bodine were able to continue racing. Requiring a 9 minute, 42 second red flag to clean up the wreckage left by the 6-truck crash, the race restarted with only a green-white-checkered situation meant to decide the Mountain Dew 250. Getting massive assistance from Kyle Busch, leader Aric Almirola was vaulted ahead of other competitors making it appear the 26-year old driver would get his first superspeedway victory. However, as the lead pack flew out of turn 4 on the final lap, Almirola's #51 Toyota skated up the track just enough to open the door for Busch's #18 Toyota setting up a drag race to the line. As Almirola moved down to tighten the opening for Busch, minor side contact was made giving third place runner Johnny Sauter piloting the #13 Chevrolet an advantage in momentum. Coming to the line, Sauter charged up the outside of the Toyotas making the charge for the Talladega truck series win a three-wide situation. Though #18 Toyota lost some of his drafting 'sling-shot' speed in brushing with Almirola, Kyle Busch edged out the #51 Toyota to win the Mountain Dew 250. Busch's testified in victory lane that he had intended on remaining on the rear bumper of Almirola but competitors should know better than to expect Kyle Busch to settle for 2nd place. The margin of victory was recorded at a mere 0.002 seconds. This fight for the Mountain Dew 250 win registered as the closest ever finish in the NASCAR Camping World Truck Series (in fact, the top-3 NASCAR touring series) since the introduction of electronic timing and scoring. Finishing 18th place running wounded after suffering damage in the lap 93 accident, Camping World Truck Series leader Todd Bodine is still safely in the top spot but did lost some of his gap over 2nd place Aric Almirola.